I am generally an optimistic person, and looking ahead at 2010 things feel pretty good. Conversations with HR and IT professionals are more upbeat than they’ve been in a long time. And even though analyst predictions for IT spending are only looking a little better than last year, companies seem to be back to planning and starting projects. It was tougher to be optimistic at the beginning of 2009. With the economy at a standstill, decisions on enterprise IT spending were hard to come by. I can’t tell you the number of times we were selected by customers in the first half of 2009, only to see a project stall as decision makers were uncertain about their own business. 80 Customers are live on HR, Payroll or Financials, over double the number from a year ago. 500 Customers, partners and prospects attended our third User Conference in San Francisco. 10 Global 2000 companies (most with more than 10,000 employees) selected Workday as a system-of-record in just the second half of 2009, including organizations in the Manufacturing, Technology, Healthcare, and Chemicals industries. 3 Major updates delivered by Workday’s R&D team to our customers during 2009. 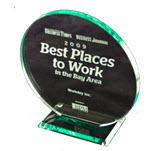 #1 Workday’s rank on the list of the Best Companies to Work for in the Bay Area. Looking back, the economic challenges of the first half didn’t slow companies’ need for innovation in enterprise software at all. What the economy did do is increase the focus on cost savings and vendor accountability. Frankly, what I hear the most is that companies are frustrated with legacy vendors’ high maintenance fees, complicated products, and slowing pace of innovation. Customers are still looking for HR and Financial systems that can support modern business, whether that means lowering the cost of ownership for the IT team through the economies of Software as a Service, automating global business processes for HR and Finance, or delivering a valuable, Web 2.0 user-experience for managers and employees. These are the things that we get to focus on every day. So looking ahead to 2010, we have a terrific group of new customers to make successful, we’re on track to deliver three new updates to our solutions, and we just recently passed 400 employees on the Workday team. That team and our culture are the foundation of our ability to innovate, make our customers successful, and grow our company. I have reasons to be optimistic.